You can use the shaker to sprinkle chocolate, cinnamon, nutmeg, or for making Latte Art. - Be sure that the distance between the foam and top of the cup is small. - Place in a sieve cocoa, cinnamon or chocolate powder and sift few times directly. - Enjoy a delicious feast for the fancy coffee. 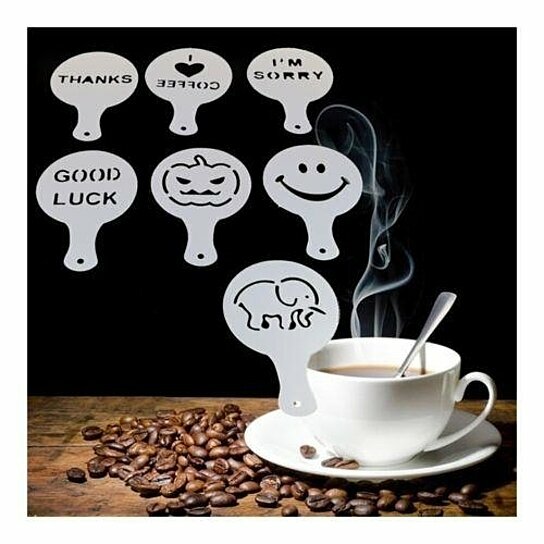 7 Designs of translucent coffee printing template for decorating beatiful coffee latte drinks. Special cappuccino coffee production modeling, Suitable for most of the caliber of the cup. feature:8 Designs of translucent coffee printing template for decorating beatiful coffee latte drinks. Great for make fancy Cappuccino's, Coffee, Latte's or Hot Chocolate, And you also can use it to decorate cake, DIY - Do it by yourself!~ and you can enjoy the delicious and pleasing fancy drinks at home!~, Food grade PP Plastic, exquisite designs, It is made of safe and easy-clean plastic stencils, Special cappuccino coffee production modeling, Suitable for most of the caliber of the cup. occasion:Home, Kitchen , Hotels, Shops, Restaurants, Cooking schools, cafes, Bars, and tea napkins etc. size:Approx. Diameter 12cm, Edge to handle length 18.3cm, Pattern mold about 7-8cm. Thanks for your understanding. Please prevail in kind.